Background: Pregnancy in renal transplant recipient is a high risk pregnancy, associated with increased risk of graft rejection and other complications. Many pregnancies have been reported, still there is limited data on optimal counseling and clinical management of these patients. Objectives: To study maternal and fetal outcomes in renal transplant recipients. Material and methods: Study design: This is a retrospective observational study conducted at tertiary health center in Ahmedabad, from 2004 to 2014. Sample size: There were 3016 renal transplant recipients out of which 2507 were males and 509 were females. Among 509 females, 211 recipients were in reproductive age group (20–40 years) who were included in the study. Out of 211 recipients, 113 (53.5%) had complete family, 46 (21.8%) did not tried for pregnancy, 33 (15.63%) were lost to follow up, 16 (7.58%) patients conceived and 3 (1.41%) were infertile. Method: Maternal and fetal outcomes were studied and patients were followed up till 2 years of postpartum. Exclusion criteria: Unmarried, divorcee and widow patients were excluded. Results: There were 16 patients who had conceived, out of which 8 patients had abortions, 6 patients had full term deliveries and 2 patients had preterm delivery. Two patients developed newly diagnosed gestational hypertension from 20 weeks of gestation. One patient had graft rejection 2 months post abortion and one had cholestasis of pregnancy from 7 months of gestation. On follow up, one patient expired 1 year after abortion due to tuberculosis meningitis and one patient (10 months post abortion) is on intermittent hemodialysis since 3 months, after 1.5 years of renal transplant. Conclusion: These patients are at risks for developing many complications during pregnancy, out of which graft rejection is most grievous one. However, with proper peritransplant and periconceptional counseling regarding optimal time for pregnancy, these patients can have good pregnancy outcome. Aim: To study the efficacy and tolerability of sofosbuvir and ribavirin in post renal transplant patients with chronic hepatitis C infection. Methods: Data of 20 hepatitis C positive patients who had a negative viral load prior to renal transplant were analysed. They were given treatment with sofosbuvir 400 mg/day and dose adjusted ribavirin for 12 weeks, when they were found to have viraemia after transplant. Viral load was monitored at 4 weeks, 16 weeks and 24 weeks after initiation of therapy. Results: 12 patients had genotype 1, 6 patients had genotype 3 and only 1 patient had genotype 4. 1 patient had mixed genotype infection. The median viral load was 3,394,705 IU/ml. Virological response was assessed at 4 weeks, 16 weeks and 24 weeks after treatment initiation. Rapid virological response (RVR) was seen in 19 patients (95%). Virological response at 4 weeks after treatment completion (SVR 4) was seen in 19 (95%) patients. Data were available for 13 patients who completed follow-up for 12 weeks after treatment completion. The remaining patients discontinued the drugs due to financial reasons. Sustained virological response at 12 weeks after treatment completion (SVR 12) was seen in 10 out of the 13 patients (76.9%). 3 patients did not attain SVR 12 and were regarded as treatment failure. The drugs were well tolerated in the majority. 1 patient required erythropoietin temporarily after ribavirin therapy. Conclusion: Sofosbuvir and ribavirin showed a good efficacy and tolerability when used in renal transplant recipients. However, the genotype, nature of underlying liver disease, duration of therapy play an important factor in deciding the response to therapy. Introduction: Kidney transplant remains one of the pioneer branches of solid organ transplant worldwide. With refinement of surgical techniques, especially vascular anastomosis principles, the incidence of surgical complications remains low. Also with introduction of modern immunosuppressant protocol, the incidence of acute graft rejection has come down to less than 1%. But, surgical complications still remain one of the most important post-transplant complications in both early and late periods. 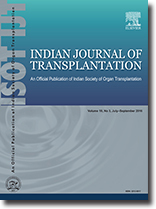 Methods: This is a prospective, observational study comprising both live related and deceased donor transplant cases from January 2011 to December 2012 in Department of Kidney Transplantation, Care Hospitals, Hyderabad. Donor characteristics, including number of renal arteries, were noted. Post-renal transplant surgical complications, including arterial, venous, ureteric, lymphocele, and wound infections, were studied. Results: We observed arterial stenosis in 3 (3.66%) patients, arterial thrombosis in 1 (0.91%) patient, venous thrombosis in 1 (0.91%) patient, 4 (3.66%) ureteric complications, 5 (4.58%) wound infections, and intracranial hemorrhage in 1 (0.91%) patient. Conclusions: Surgical complication rates were relatively low in our study. Early diagnosis and effective management of surgical complications were associated with both better graft and patient survival after one year of follow-up in this study. Background: Currently, Malaysia follows the informed consent (IC) system of organ donation; however, the rate of organ donation in the country appears very low, and implementing a presumed consent (PC) system could help in enhancing the rate of donation. In determining the success of PC system, exploring the Muslim's perception toward the system is crucial. Method: We conducted a questionnaire-based survey between October and December 2013. Self-administrated questionnaires were distributed among 829 Muslims in Kuala Lumpur. Results: The results show that 42.8% people of the Muslim community are unwilling to donate, while 17% of them are willing to sign objection form if the PC system were implemented. The PC system may violate the autonomy of about 25.8% of the Muslim community. Conclusion: Implementing the PC system would have helped Malaysia to overcome the issue of organ shortage considering the fact that the majority of the people from Muslim community are willing donors. However, it is also important to consider the unwilling donors' autonomy while designing the PC legislation, and further studies require understanding the reasons behind their reluctance to donate. We propose that a priority scheme for organ allocation should be included in organ donation legislation. Ureteritis due to human polyoma BK virus (BKV) is an emerging complication among renal transplant recipients mimicking rejection. The current mainstay of intervention is to reduce the immunosuppressive maintenance therapy. There is dilemma in management regarding surgical interventions like stenting besides reducing immunosuppression. The present case report highlights the successful management of BKV ureteritis with modification of immunosuppression and Double J stenting. A combination of immunosuppression modification and DJ stenting can help long-term graft outcome in patients with BKV ureteritis. Introduction: Oral candidiasis in renal transplant patients is common. The most common types are acute atrophic (erythematous) and acute pseudo-membranous (thrush), even in renal transplant patients. Hyperplastic variant is uncommon even in transplant patients. Case: We report a 42-year-old female, post-cadaveric renal transplant recipient who developed hyperplastic oral candidiases on the dorsum of the tongue. Patient was on immunosuppressants and developed post-operative acinetobacter pneumonia. With a combination of anti-fungals, antibiotics and supportive care patient was successfully treated and discharged home.